Application: Ideal for confined spaces, these skimmers use a self-adjusting weir that floats and finds the oil/water interface, permitting the oil layer to flow over the weir and into the bowl. Use with pumps feeding oil/ water separators, waste water treatment plants as well as oil spill recovery and other environmental or industrial applications. Top suction (vertical) minimises hose twisting in confined areas. 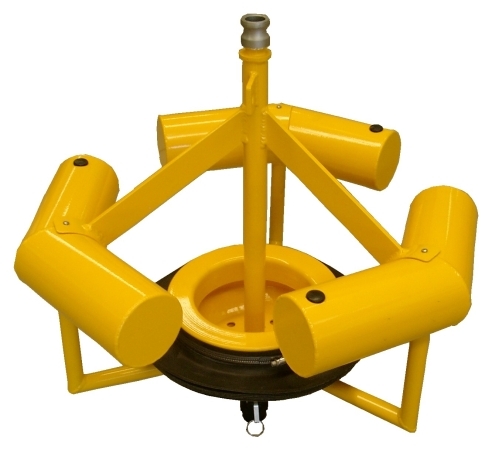 Compact size - ideal for small sumps, pits and tight spaces (>600mm diameter). Lightweight and easily moved and operated by one person. Can operate in very shallow water. Manufactured from marine grade aluminium. For oil spill response, the spill should be contained and thickened with the use of a boom. The skimmer is then placed where the oil is thickest. Trash screen to prevent debris from entering the weir.